Vineyards sits beneath the Fish market Restaurant and is a dark cavern of a place that is pleasantly cool in summer and warm in winter. It is divided into three separate seating areas that are secluded from each other and quite cozy. 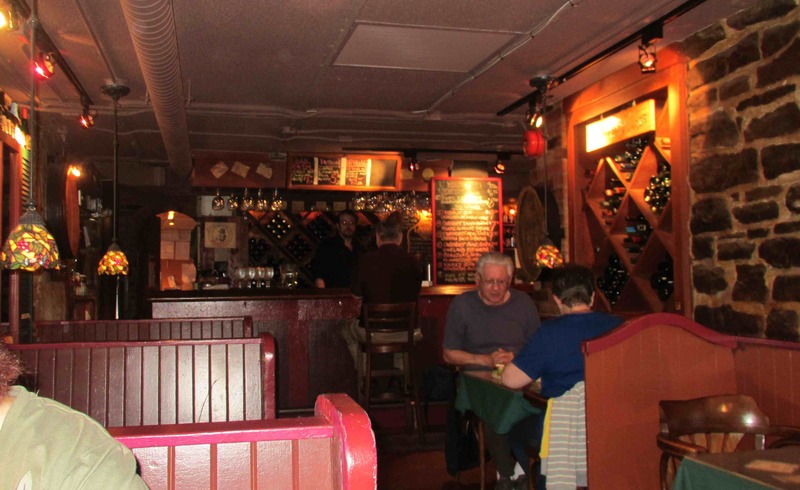 As this establishment operates as a traditional style wine bar, patrons are expected to repair to the bar for their drinks while food is served directly to the tables. Our waitress on this occasion was polite and efficient, while the bar staff, as always, were garrulous and friendly and knowledgeable about the beverage selections. 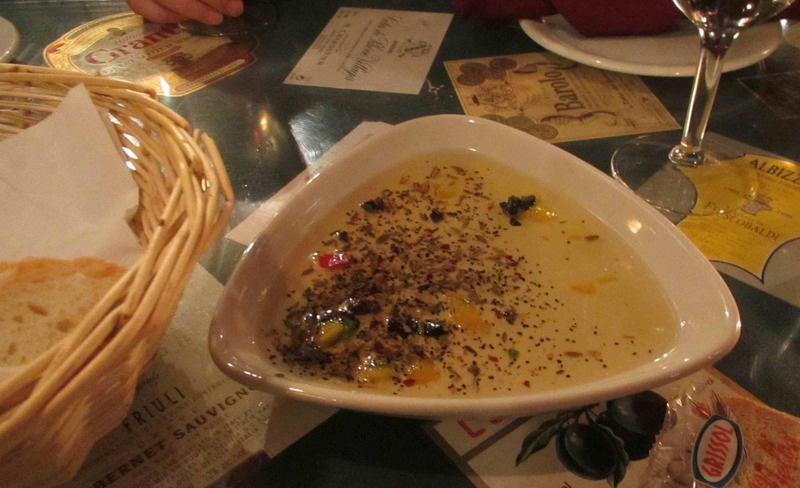 Once my dinner companion and I ordered our main dish, we were served with a complimentary appetizer consisting of a basket of bread accompanied by a dish of warm olive oil containing black olive, red and yellow peppers and crushed spices. The spices included black pepper and fennel seed and their flavor infused the oil very nicely. There was also a cheese table provided which had 5 or 6 types of cheese available at no additional charge and, while my companion tried several of these, I just nibbled on a pleasant, but otherwise unremarkable slice of Emmenthaler. My companion I ordered both this dish and, while we generally enjoyed it, I didn’t think it was as good as the way I make at home. As advertised, it contained shrimp, mussels, scallops, squid, chorizo and chunks of some sort of white fish. The rice appeared to be basmati, and was coated in a nice, spicy tomato-based sauce, but unfortunately, it was a little undercooked. 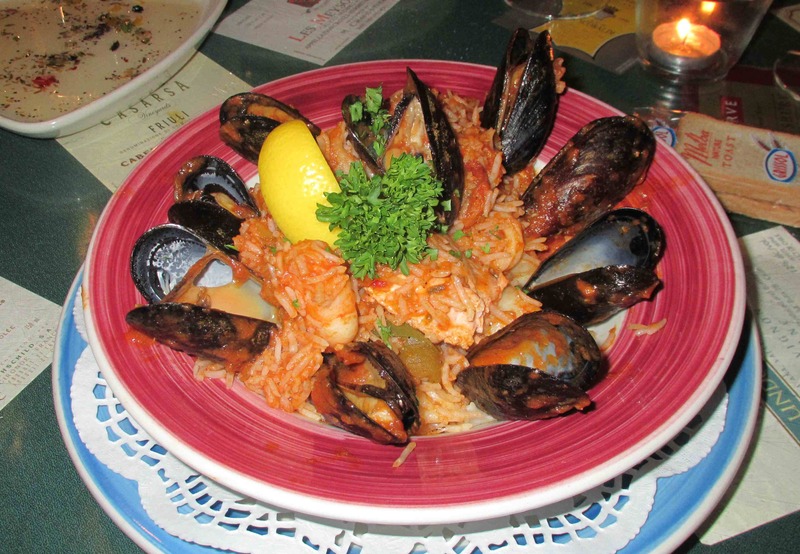 The seafood was very nice except for the fish, which was a bit bland, and the mussels, which were definitely not of top quality and had an unpleasantly soft texture as though added a little too late. The dish, all in all, was a bit of a disappointment and I could only rate it a 2 out of 5. I have read the odd review that suggests you should go to Vineyards for the drinks but stay away from the food. This, however, is a bit of a harsh criticism, to my mind as our meal, while not top-notch was hardly horrible and I saw a gentleman at the table next to us enjoy a pasta dish that looked very good. I was able to sample several very decent beers and my companion and I found the ambience pleasant and the service generally excellent. 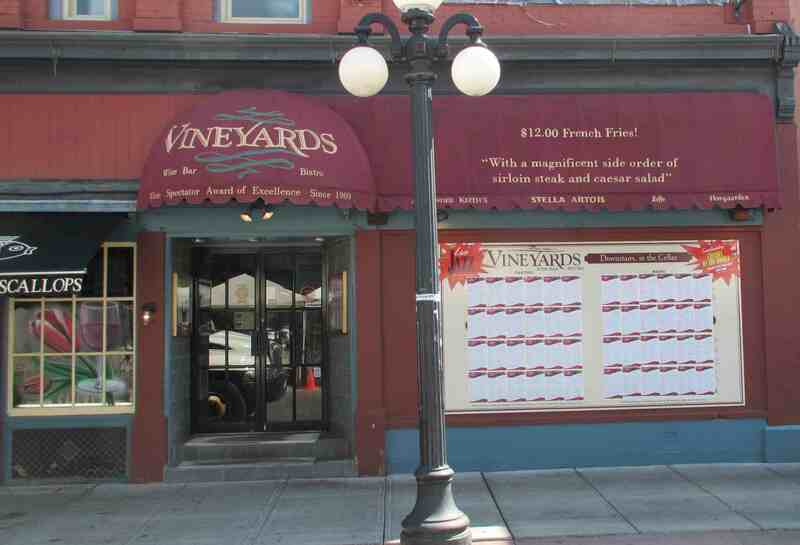 I think, on the whole, that I will probably not rush back just to eat at Vineyards, but it is still one of my favorite places in the city. You are making me want to visit Ottawa more and more.